The next time you find yourself in Soho, go to Broadwick Street where at one end you’ll find a village pump, while standing on the junction with Lexington Street is a pub rejoicing in the name John Snow which looks inviting for a swift half in this pub that takes its name from one of London’s forgotten heroes. In 1832 London was to experience a brand new epidemic imported from India, a disease which would strike fear into every person in the Metropolis. Cholera became known as ‘the poor man’s plague’, with a mortality rate of 50 per cent and most victims coming from poor areas of inner cities the disease was dismissed by the well to do as a consequence of “the Great Unwashed” as William Makepeace Thackeray dubbed them. BUT THEN CHOLERA BEGAN to strike in middle-class neighbourhoods too, making it truly a disease to cause panic. One could awake hale and hearty, develop diarrhoea, vomiting, agonising cramps and by teatime succumb to delirium and death. Now contagion became a national obsession, and incredibly between 1845 and 1856 over 700 books on cholera were published, most expounding the common belief that it arose from impure air, blaming a miasma, or any smell, and in Victorian London there were no shortages of miasmas. Surmising that ‘All smell is disease’, the founder of the workhouse, Edwin Chadwick managed to keep the scientific establishment off the scent (if you’ll excuse the pun) for two decades declaring if you removed the smell, cholera would go away. The miasma theory had just one serious flaw: it was entirely without foundation, and one man alone identified this fact, his name was John Snow. Born in York in 1813 and having a father who was common labourer served him well in terms of insightfulness and unlike his colleagues, he did not blame the poor for their own diseases. Snow had studied medicine and became one of the leading anaesthetists of his day, attending Queen Victoria’s eighth childbirth while administering chloroform a dangerous and virtually untried practise. Snow spent his spare time trying to understand where diseases came from; why for instance was the rate of cholera six times higher in Southwark than neighbouring Lambeth, if the infection was carried by a miasma? Furthermore, if smells caused disease would not toshers, flushermen and nightsoil handlers be the most frequent victims? Snow collected recorded cases in a scientifically robust manner making careful maps of the outbreaks. He found the people of Lambeth drank water piped in from clean sources outside the city, whereas neighbouring Southwark obtained its water from the polluted River Thames. In 1854, a particularly virulent outbreak hit Soho. In a single neighbourhood around Broad Street (now renamed Broadwick Street) more than 500 people died in 10 days, making it, as Snow notes, probably the most devastating occurrence of sudden mortality in history, worse even than the great plague. The toll would have been higher except that so many people fled the district. The conclusive proof was in finding a victim of cholera who lived in Hampstead who liked the Broad Street water so much she had it delivered to her door. Snow managed to persuade the parish council to remove the handle from the water pump in Broad Street, after which cholera deaths vanished. It is hard now to appreciate just how radical and unwelcome Snow’s views were at the time, he was detested from many quarters, in part, probably because of his humble beginnings. In 1850 London had a summer heat wave and the ensuing drought prevented waste being washed away. Dubbed “The Great Stink” as the Thames grew so noxious no one could stay near it, Parliament had to suspend its sittings and it was only this disruption to Members of Parliament that gave rise to giving London fresh water and sewers. Snow never got to see his assumptions vindicated, dying from a stroke during the Great Stink at the young age of 45. At the time, his death was hardly noted. 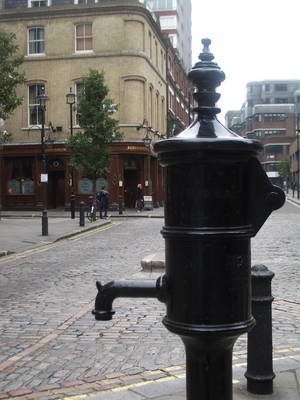 So raise your first glass in the John Snow Public House and toast the hero who has made it possible to drink the water and well as beer in London.